ChiIL Live Shows/ChiIL Mama has been rockin' Pitchfork bands all year. We've been sharing their tours, forwarding their free downloads and posting their new videos all year long. We've also been shooting their live shows in Chi-Town and shooting original band video interviews. Now it's just about time again for summer festival season, so get your Pitchfork tickets and come get your groove on and rock Union Park. Last year, my son Du-Jay who was 10, had the opportunity to go behind the scenes and interview a number of the musicians at Pitchfork himself! He came with a class full of kids from 826CHI, one of our fav non profits for free creative writing classes. Pitchfork's known for hosting awesome info booths for most of our city favorites like Girls Rock Chicago, 826CHI, and roller derby! They have an excellent, eclectic assortment of crafts, collectable posters, vinyl and more. And the food booths are a multicultural bonanza of tasty treats. We've gone AND taken the kids just about every year and they have a blast!! In its seventh year, the Pitchfork Music Festival continues to be one of the most well regarded and exceptional festivals in the country. Consistently praised for its discerning lineup, inviting and laid back environment, reasonable prices, wide array of activities, and much more, there is very good reason why people across the world return year after year! This year’s event, happening Friday, July 13 – Sunday, July 15 at Chicago’s Union Park, is now less than two months away. A limited number of single day tickets for each day of the fest are still available for $45 at www.ticketweb.com. As previously noted, prices have stayed the same this year! We are thrilled to be adding two more bands to this year’s fest -- Japandroids will be playing Friday, and Chromatics will perform on Saturday! As previously announced, this year’s excellent lineup introduces a creative range of emerging bands while honoring already beloved and internationally renowned acts, including A$AP Rocky, The Atlas Moth, Beach House, Big K.R.I.T., Chavez, Dirty Projectors, Feist, The Field, Flying Lotus, Godspeed You! Black Emperor, Hot Chip, Iceage, Nicolas Jaar, Kendrick Lamar, Lotus Plaza, The Men, Olivia Tremor Control, Oneohtrix Point Never, Purity Ring, Ty Segall, Schoolboy Q, Sleigh Bells, Vampire Weekend, Wild Flag, and so many more. See the full lineup below. In addition to its musical offerings, the fest also features a wide array of other activities, including 50 individual vendors, plus specialty fairs, for attendees to enjoy. News regarding these festival elements will be announced in the coming weeks. This year, we are excited to introduce “The PMF Upgrade Challenge.” For one hour, once a week, Chicago radio station and festival partner WXRT 93.1 will present “The PMF Upgrade Challenge” for festival ticketholders. 2012 attendees are invited to participate for a chance for them and a friend to be upgraded to VIP for the entire festival weekend. Even if you just have a single day pass, you and a friend will be upgraded for the entire weekend! To participate, keep an eye on WXRT and the Pitchfork Music Festival Facebook pages where contests will be presented in the forms of questions and other challenges. Winners will be chosen based on their responses to these contests. This will be happening at one random hour each week, and each week, two pair of tickets will be upgraded to VIP for the entire weekend. 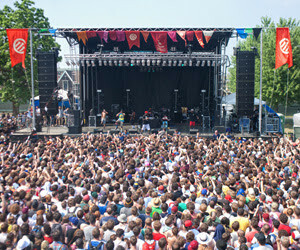 Visit www.pitchforkmusicfestival.com for more information on the 2012 festival, and to purchase tickets. Stay up on festival related news via the ChiIL Live Shows Facebook page and Twitter & Pitchfork Music Festival Facebook page and Twitter.